I am a firm believer that when you get going in any endeavor, it is important to build a “grassroots approach” to getting started. That means you should work to get your idea together in any way possible, even if that means doing it part-time while the full-time job is paying the bills. Be frugal to not spend unnecessary money before you are getting those first few clients in that bring some revenue. If securing money is necessary, you should start with the friends, family, and credit card route first. Going after the serious venture capital dollars is not an easy endeavor, will be a difficult first start, and is left for that remaining 1%. 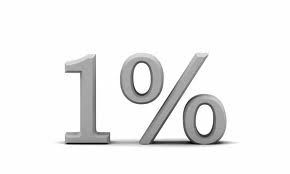 So how do we increase the odds of our success to reach the 1%? We must first get our product or service going by building out the offering, getting users, and showing some market acceptance. From there, we can begin to approach companies about additional funding. By using and providing some revenue help, you can then continue to build on this cycle. And in turn, you will slowly increase the odds that you will have success within the venture capital world, as I discussed in my recent blog, Scaling bounceit!™ by Not Scaling. Currently, I am in the process with my partners at bounceit!® to raise money and take the idea of this social voting mobile app to the next level. This week, we traveled to Columbus, Ohio to meet with a venture capital firm. As we discussed a plan to raise capital, they saw other opportunities for applications of bounceit!®. I am hopeful that this will be a very good arrangement for both parties. I will keep you updated as we progress. We are at this point of approaching venture capitalist because we have followed the steps mentioned above. We have invested our own money and time, gotten bounceit!® out there, and been receptive to the users’ feedback. Our first vertical is approaching campaigns and implementing a ground-level polling analysis. We are taking the next step and talking to businesses that are ready to sign up, and get a plan together to enter next year’s political season. My first two companies were done from a “grassroots approach” and not taking any outside money. The success of the IPS Funds were all grown with one new investor after another. Efficience was grown from some money I had from IPS, but not from any outside investors. So this side of a startup will be a new experience for me, and we look forward to becoming part of that 1%.